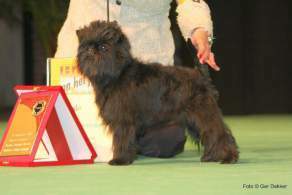 The Affenpinscher is a bold small terrier which was bred in Germany in the 1600's to hunt mice and other small vermin. 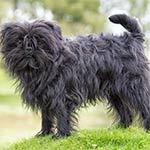 Directly translated, Affenpinscher means "monkey terrier", a name which accurately describes the somewhat shaggy and unkempt appearance of the dog. 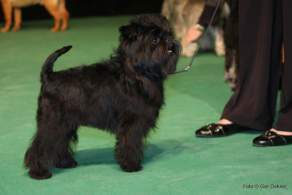 Overtime the Affenpinscher was bred to be smaller so they could serve as a better companion dog, however their hunting instincts still remain as they have a strong drive to chase smaller animals. Below are basic details for the Affenpinscher. These details highlight the breed's average size/weight as well as the breed's best skills. Affenpinschers are charming toy dogs full of feistiness and energy. 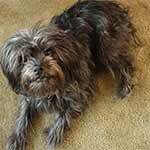 The affen's unkempt appearance and fearless attitude have given the dog many nicknames. 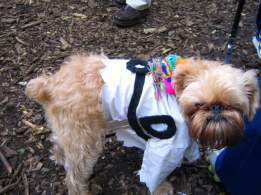 Two of the most popular are "Monkey Dog" (which is affenpinscher directly translated from German) and "Mustached Little Devil" or "Diablotin Moustachu" in French. Originally bred to be a smaller ratting dog (whose job is to rid homes of mice), they became sought after by women as the breed's average size decreased. Eventually the breed's intelligence and charm made the dog more popular as a companion dog and by the 18-19th centuries the dog was mostly used for companionship. Affenpinschers have a clownlike personality with a fearless attitude and are often described as thinking they're a bigger dog than they really are. Sometimes their bold attitude may be too much, so they need to be monitored when around larger dogs so they don't over provoke the bigger dog. These characteristics oftentimes make affens charming and entertaining to watch. Affens are alert and fearless which makes them excellent watch dogs. While they aren't necessarily loud dogs, they can get excited easily and it can take a while for them to calm down. This may be an issue in smaller high-traffic apartments since the dog will alert you (and everyone else) to any unexpected visitors approaching the affen's territory. Although intelligent, Affenpinschers are often described as being stubborn and will need consistent training to reach their full potential. They learn best through praise and positive reinforcement, so training shouldn't be a major concern as the breed is eager to please their master. 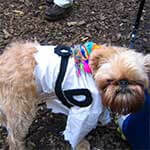 It is also recommended to socialize the breed with other dogs and people so they can grow up well rounded. Despite the breed's intelligence and charming behavior, they are not too fond of smaller children. Because of this, they are not recommended for families with children as the affen won't hesitate to bite if provoked. Generally, this behavior is mostly seen when the dog is over-provoked, cornered, or teased so the affen shouldn't be an issue in a household with children who are aware of this. 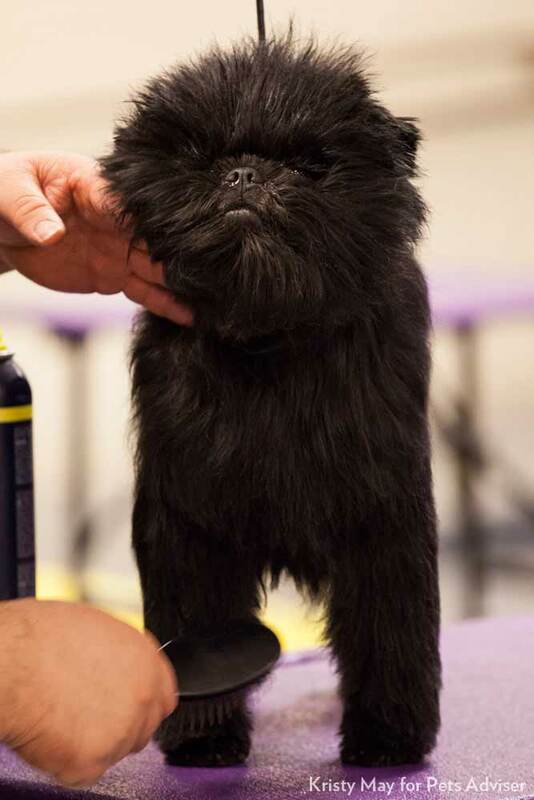 Overall, the affenpinscher is full of stamina, courage, and humor. They are surprisingly intelligent and are quick to learn with the right training methods. Their small size and quick adaptation to change makes them an ideal traveling companion for people on the go or for those who want a dog they can take with them everywhere. The Affenpinscher breed originated in Germany and has "officially" been around since the 1700's which classifies it as an ancient toy dog breed. 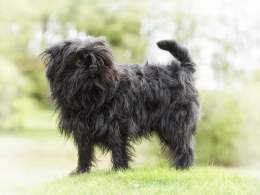 However, there are paintings and descriptions of dogs eerily similar to the affenpinscher dating as far back as the 15th century which many believe were early ancestors of the breed. During this time period rats were a large nuisance and many homes and businesses used dogs to rid the property of vermin. Terriers were ideal dogs for the job and were sought after by many for their ratting abilities, however these dogs were a bit too large to do their job inside (especially in smaller rooms like the boudoir). 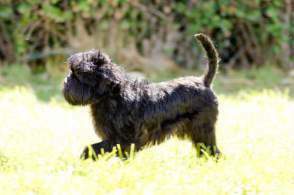 Eventually the ratting terriers were bred down in size so they would be better suited to do their job inside, with the end result being a small monkey looking dog which they called the "Affenpinscher". Directly translated from German, "affen" means "monkey" and pinscher means terrier. As the affenpinschers popularity grew, people took notice of the breeds intelligence, unique appearance, and companionship and continued breeding down the dog's size from 12-13 inches tall to 9-11 inches. As the dog's size decreased the breed quickly became a welcomed dog for Women not only for companionship but also for it's ratting skills. This is mostly because women at the time wore long dresses and oftentimes scurrying mice would seek their outfits for shelter when startled or being chased. The affenpinscher solved this problem as the breed was small enough to be taken into women's quarters and boudoirs as a ratter without being a nuisance. This caused the breed's popularity to spread across Central Europe and it became a common housepet during the 18-19th centuries. Unfortunately, due to a lack of documentation there is no concrete evidence of the breed's bloodline so the exact genetic makeup of affenpinschers will likely remain unknown. With this in mind, many feel some of the affenpinschers parent breeds included pugs, german pinschers, and german silky pinchers. 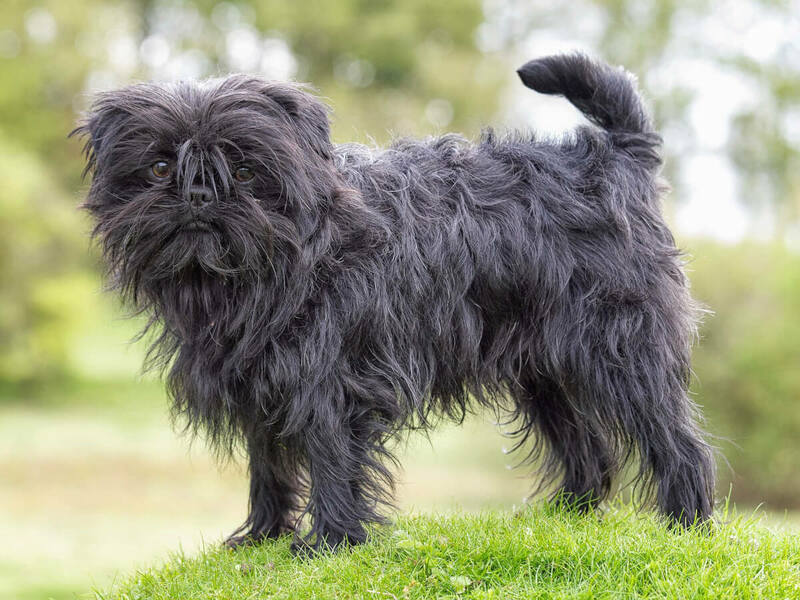 Since the affenpinscher breed is several centuries old it comes as no surprise that they were used to breed future purebred dog breeds such as the Brussels Griffon and the Miniature Schnauzer. The breed standard for the affenpinscher was finalized in Berlin in 1917, however it's popularity was dramatically affected by World War II. Since then the breed has been accepted as a purebred dog by many registries and canine clubs, but while the affenpinschers popularity is growing, it is still considered a rare breed. 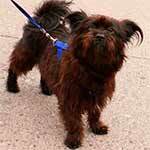 The affenpinscher is a toy dog breed and generally weighs between 6 and 13 pounds. They are almost exactly as tall (from the ground to the withers) as they are long (from the shoulder to the buttocks), which gives the breed a square appearance. They have a neat but shaggy appearance as their wiry coat is generally short enough to be out of the way, but long enough to appear unkempt. The breed's coat is dense and rough and is generally an inch in length on the shoulders and body, while the hair on the stomach and legs is generally less harsh and is longer. Their tail can either be docked to 1 to 2 inches in length or left natural. 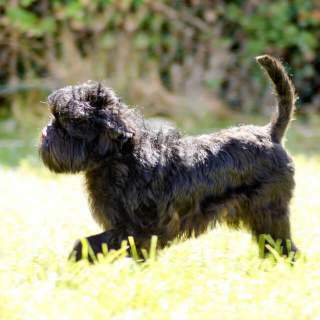 When walking the affenpinscher will carry its tail high and curved slightly over the back. Acceptable colors are belge, black, black & tan, gray, red, and silver. Some affens will have a small white spot on the chest, however large white spots/patches are not desirable. Affenpinschers are small-sized dogs. Their height ranges between 9½ and 11&frac12 inches and they weigh between 6-13 pounds. 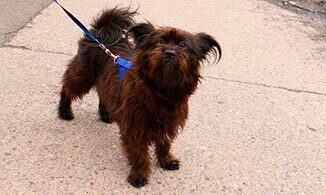 Similar to other small dogs, affenpinschers act like they are much bigger in size than they really are. They have a bold and courageous attitude, which may require it's owners to supervise their behavior to make sure they don't over-provoke larger dog breeds. They still maintain a strong desire for ratting, so they are a very alert dog. The breed can be stubborn at times, so the owner will need to use a steady training schedule to make sure the breed is well mannered and socialized. Affenpinschers are known to be a difficult dog to housetrain. Affens generally get along with other dogs and pets, but they are territorial with toys and can be easily provoked so they should not be left alone with smaller children. Affenpinschers are not recommended for households with smaller children. This is because the breed is easily provoked and is very territorial with their property (such as food, toys, etc.). This combined with the affen's fearless attitude means the breed will not hesitate to bite anyone that provokes them. Affens are also easily excited and are not necessarily fond of unexpected surprises. A sneeze, people play fighting, or someone quickly grabbing the affen can trigger a snappy response which may surprise those unfamiliar with the breed. This can make affens a difficult breed to be around children. Having someone monitor the breed when around guests or excited children is necessary and can help to better socialize the breed. Affens get along well with other pets, however they can be territorial with food and toys so setting a few boundaries may be necessary until the pets are better socialized with each other. Affenpinschers will often try to take on larger dogs, so it is necessary to closely monitor the breed before they are fully socialized to make sure they don't provoke a negative response from larger animals. Affenpinschers are naturally suspicious of strangers and unexpected guests will almost always make them excited. This makes them good watch dogs, however it can sometimes be too much especially if you frequently have guests. Generally affens will bark to alert everyone around them of a potential threat, however they don't bite unless provoked. Affen owners are encouraged to socialize their dogs as much as possible to prevent the frequency of "false-alarms" with guests. Socialization is best done while the dog is young, but can still be effective with older affens. 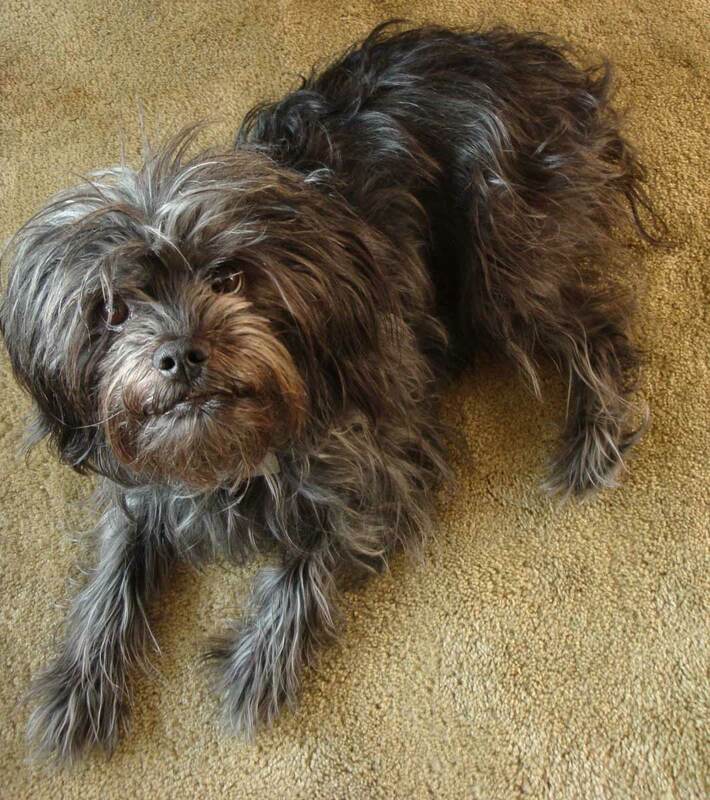 Below are pictures of the Affenpinscher dog breed. 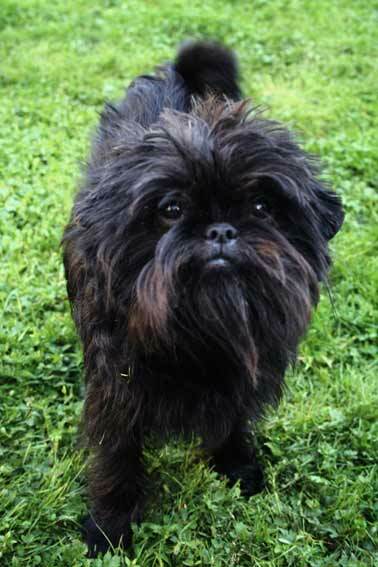 The affenpinscher is a low maintenance dog. As a toy breed, they don't require too much activity to reach their exercise and sheds very little. Most of the breeds maintenance will consist of socialization and training. The Affenpinscher's short coat should never be clipped short. Doing this can ruin the coat for many years. It sheds very little but still needs to be brushed weekly. Although the coat shouldn't be cut short, it may need to be trimmed occasionally, especially in areas that can cause irritation such as the corners of the eyes. Take care not to overtrim the breed's facial hair as the monkey like appearance is a trademark of the breed. A daily walk is generally enough activity to satisfy the breed's exercise needs. As a toy breed they do not require a large amount of exercise and some days playing with the dog will be enough exercise. Affenpinschers are toy dogs with a fearless attitude. Because of this they should be a strictly indoor dog. If they are outside they will need to be monitored not only because their small size makes them an easy target for large birds and other animals, but also because their bold attitude can provoke other animals. As an indoor dog affenpinschers are comfortable in the same temperatures as most people. They are sensitive to extreme temperatures so they should be bundled in the cold and kept cool in the heat.